Grab your Discounted Free Hand Feeding Bottle Holder while the store LAUNCH DISCOUNT is on. Once we reach 200 unit sales, we will be increasing the price back up to $49.99. How does it feel to have your hand back?! Pretty awesome, if you ask us. Now you can read to your baby, caress her, or even include her at the table during a family dinner while she eats (and you eat, too!). Parents of infants, listen up! We’ve recently discovered a feeding-time product that can only be described as a legit “holy grail.” It has completely transformed the way we bottle-feed our little ones. In fact, the light-weight device has allowed us to literally RECLAIM our right hands during feeding time, and it will for you, too! 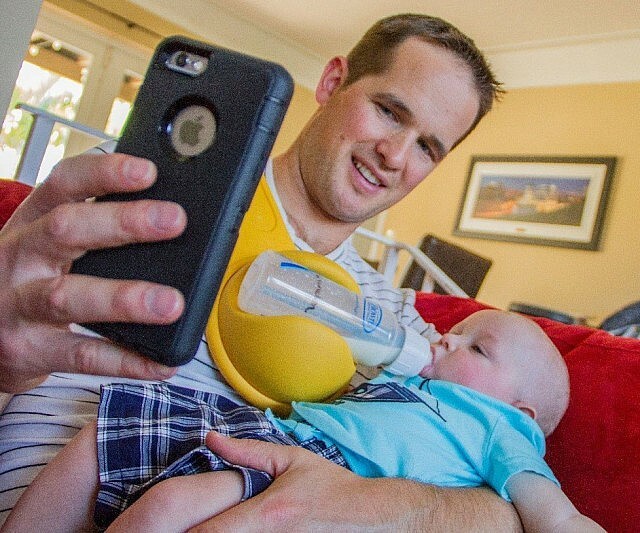 Here’s how it works: Drape the device over your shoulder and insert your baby’s favorite bottle into the rotating foam disc. Re-position the device so that it rests high on your shoulder, then adjust the bottle with the 360-degree turning mechanism to fit your little one’s preferred feeding position. Once you’re all set, let that baby enjoy her liquid sustenance. Voila– and yum! The Free Hand Bottle Holder frees up a hand during these precious moments, giving you the ability to read a book to your baby, massage and caress your baby, or even enjoy family meals together. Perfect for parents who bottle feed with pumped breast milk or formula. Nursing moms have a free hand; now bottle feeding parents can too! Nursing moms have a free hand, now bottle feeding parents can too! Place the device over either shoulder, positioning the bottle holder just below your shoulder above your breast, then insert your baby's bottle. The rotating bottle holder helps you find the perfect feeding angle, and even rotates out of the way while burping or playing with your baby. Q: How should I wear the Free Hand Feeding Bottle Holder? A: Place the device over either shoulder, positioning the bottle holder just below your shoulder, high up on your chest. Then insert your baby's bottle. This position keeps your baby upright with the bottle at the right angle once you rotate it. Q: Is it made from ‘baby safe’ materials? A: Yes! The Free Hand Feeding Bottle Holder was designed and used by a parent, with safety in mind. All materials are BPA-free, lead-free, PVC-free and phthalates-free. Q: Will it fit my bottle? A: The Free Hand Bottle Holder fits just about any baby bottle because the holder is made of squishy foam. If it feels a little tight turning the bottle holder with your bottle in it, you can loosen up the holder by spinning it back and forth. Q: Is the Free Hand Feeding Bottle Holder heavy? A: No, the device isn't heavy; it's lightweight and comfortable even with a bottle of milk in it. Q: Will it stay on my shoulder? A: Yes! The ribbed underside grips your clothes and the counterweight at the back of the Free Hand Feeding Bottle Holder keeps it balanced and securely in place. Q: How do I clean my Free Hand Feeding Bottle Holder? A: The bottle holder separates from the pad for easy cleaning with a soft cloth and warm soapy water. Q: How do I transport my Free Hand Feeding Bottle Holder? A: The device rolls up to fit nicely in a diaper bag, stroller or purse for a trip to the park, to a play date or out to a restaurant.